Deborah Kass, “After Louise Bourgeois,” 2010. 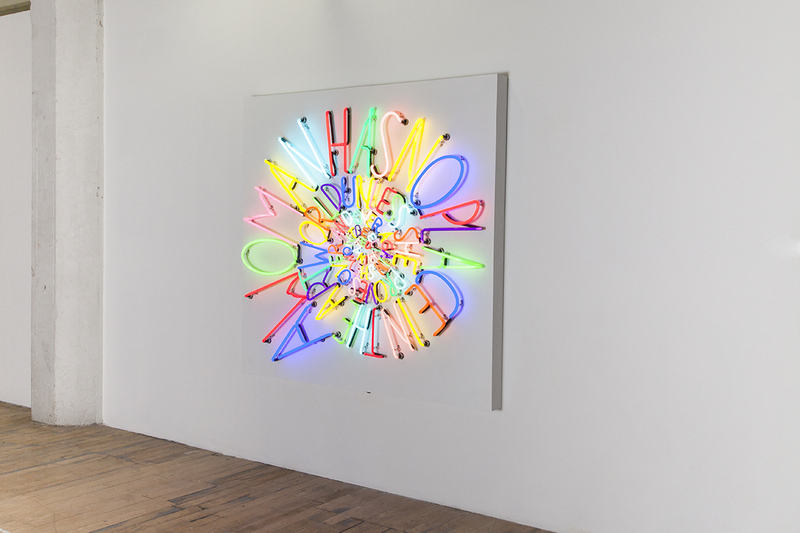 Neon and transformers on powder-coated aluminum panel, 66 x 68 x 5″. Courtesy of the artist and Paul Kasmin Gallery. Photo by Rachel Styer. Deborah Kass likes to have fun but with a vengeance. Or as Eric Shiner, director of the Andy Warhol Museum, describes her, “Deb is an expert at putting a smile on her viewers’ faces, but she packs a wallop behind those smiles.” Known for her feminist vaudevillian appropriations of the great white male Pop and Post Pop canon, as in her hilarious My Elvis + from the early ’90s where the serial images of Yentil’d Barbara Streisand stands in for Warhol’s silkscreened Elvis, this girl is out to make a statement that says both: “women are here and loud and strong even if you, oh art world, want to pretend we’re not,” and “I’m gonna tell you this again and again but make you feel good each time I do it.” Which is exactly what she does in After Louise Bourgeois—(2010) her in-your-face neon spiral of the phrase: A WOMAN HAS NO PLACE IN THE ART WORLD UNLESS SHE PROVES OVER AND OVER AGAIN SHE WON’T BE ELIMINATED. What better piece to speak to the sentiment of fight, of art’s collective power, and of the joy of survival—notions that generated the entire exhibition—then this celebrated piece of Neo Pop critique. 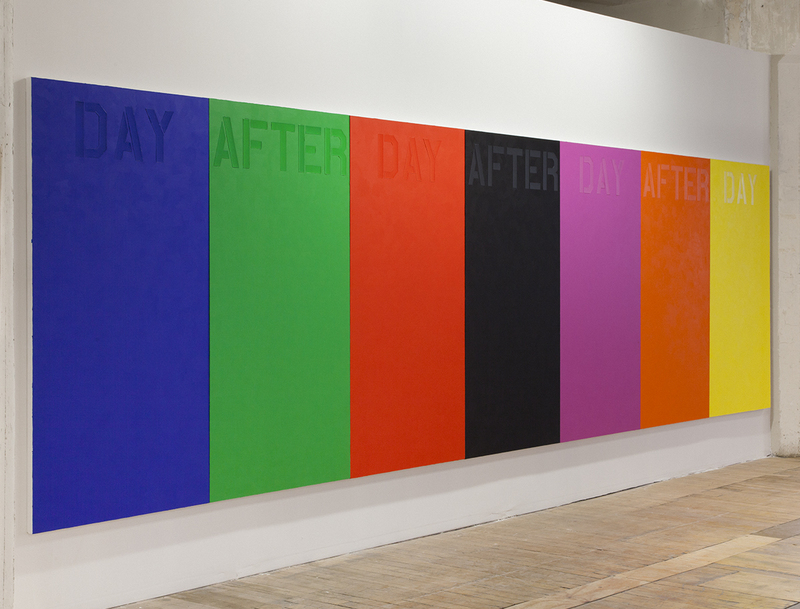 Deborah Kass, “Day After Day,” 2010. Oil and acrylic on canvas, 6 x 21′. Courtesy of the artist and Paul Kasmin Gallery. Photo by Rachel Styer.